A trip to Disney World is definitely magical but there are also plenty of opportunities to add extra magic during your stay. From special character meals to behind the scenes tours to spa treatments and dessert parties, there is plenty to choose from when looking to celebrate a special occasion or just for an extra bit of fun! 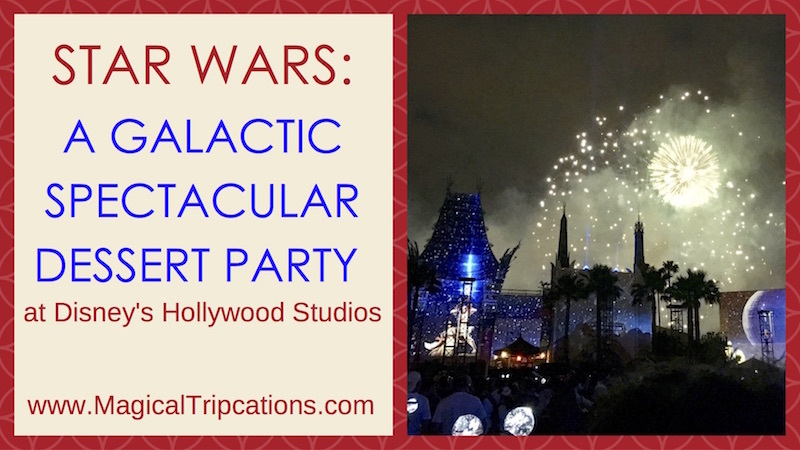 Today we’d like to highlight the Star Wars: A Galactic Spectacular Dessert Party at Disney’s Hollywood studios as we found it to be an out of this Disney world experience and put our trip to this park into hyper drive! 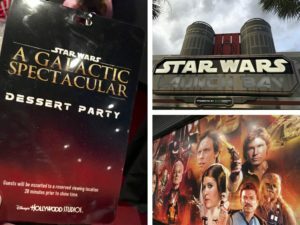 The Star Wars: A Galactic Spectacular Dessert Party is a special ticketed event meaning that there is an extra ticket that is purchased in addition to the regular park admission to Disney’s Hollywood Studios. Currently, the cost is $79 per adult (10 and over) and $45 per child (3 to 9) including tax and gratuities. 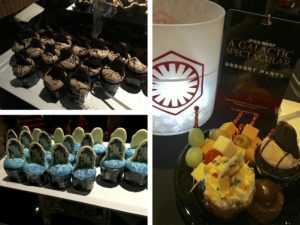 The party ticket includes an array of delectable desserts (all you care to enjoy savory and sweet treats) and specialty drinks – alcoholic beverages for those over 21 or soft drinks, coffee and water, too – to be enjoyed in a setting inspired by the films and surrounded by movie props inside Star Wars Launch Bay. Guests check-in for the party just outside Launch Bay in the Animation Courtyard. We arrived about 20 minutes before the party started to check-in and we were greeted by Cast Members who gave us instructions along with special lanyards to wear allowing us to enter and easily come and go as we pleased throughout the party. The dessert party is held inside a special guest-only area in Star Wars Launch Bay (near the Star Wars Character meet and greets). The desserts are displayed on buffet tables and there are plenty of high and low-top tables for guests to use to enjoy their bites and drinks. When we attended, we were greeted by curious Jawas looking to trade trinkets and patrolling Storm Troopers eager to keep guests in line. After the dessert portion of the event wraps up, guests are escorted by Storm Troopers from Star Wars Launch Bay to the best spot in the universe to watch “Star Wars: A Galactic Spectacular” fireworks show. Dessert partygoers watch the fireworks show from a special, VIP viewing area with spectacular views of all the galactic action. 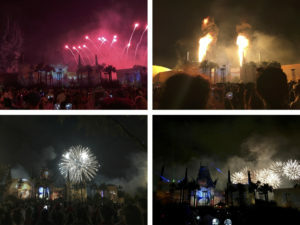 Imagine watching super-sized Star Wars themed pyrotechnics, fireworks, and projections featuring clips from the film series all set to the classic score underneath the stars in the happiest place on earth…wow – just wow – the show is amazing! And to ensure that you never forget your experience to a galaxy far, far away, party guests receive a special souvenir Star Wars novelty in addition to the super cool party lanyard. 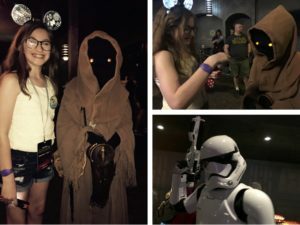 We felt like galactic VIPs the entire night and would recommend the dessert party for all…even if you’re not a huge Star Wars fan but if you ARE a huge fan, it’s a must do! Reservations to this event (and all others) are highly recommended and Disney Dining Plan credits do not cover this event. Ask your Magical Tripcations Travel Planner about tickets to this and many other special events throughout the year. We love helping our guests find the perfect combination of activities to make their adventure extra magical! Without a doubt, this is THE Dessert Party you are looking for! May the Force Be with You! Not working with a Magical Tripcations Travel Planner yet? Click here to connect with one of our magical planners.